While it’s always scary to find a lump, swollen lymph nodes are most often a byproduct of a common infection like the flu, not an indication of cancer. In addition to swelling, which can be anywhere from pea to kidney-sized, other symptoms associated with swollen lymph nodes include tenderness and/or pain in that area. Finding a lump is frightening—no matter where it is. Swollen lymph nodes are your body’s way of telling you that something’s wrong. Usually, they’re alerting you to a mild infection or illness. Once your immune system has fought the pesky invader, your lymph nodes will shrink back to their normal size. Occasionally, though, swollen lymph nodes can indicate a more serious condition such as cancer. What Can Cause Lymph Nodes to Swell? Each cluster drains a specific area of the body. How Do You Treat Swollen Lymph Nodes? A single swollen lymph node, or those that are concentrated in one area can often be blamed on a localized problem such as an infection, says Benaderet. The good news: these typically resolve on their own. Swollen lymph nodes that crop up in multiple places on the body, or a swollen lymph node that is associated with systemic (i.e. whole body) symptoms, however, can indicate a more serious health problem such as cancer or an immune disease. Those who suffer from a more serious infection (i.e. HIV) or an immune disease such as lupus may experience swelling in multiple lymph nodes at different locations throughout the body. Those with a tumor will likely notice a quickly growing, hard, and unmovable node. Swollen lymph nodes that aren’t treated can lead to an abscess (an infected, pus-filled node that may need to be drained) or sepsis (a potentially fatal infection in the bloodstream). 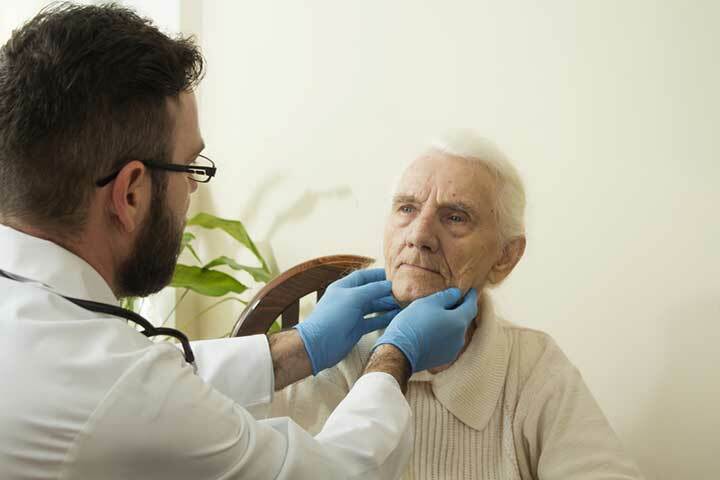 As soon as you find a swollen lymph node, book in to see your primary care doctor, suggests Benaderet. For most, finding swollen lymph nodes can be alarming, but often, “a thorough medical history and examination can figure out why a lymph node has become an issue,” he says. At that first visit, your doctor can often diagnose the cause of your condition and offer treatment. As mentioned earlier, a swollen lymph node is most commonly associated with a minor infection, so once this clears up, it will likely disappear. The term for swollen lymph nodes that are caused by a bacterial or viral infection. antibiotics, arthritis, bacteria, cancer, cancer symptoms, cancer treatment, cancers, chemotherapy, common cold, edema, flu, health, immune system, infection, leukemia, lupus, lymph node biopsy, lymphedema, lymphoma, lymphoma symptoms, massage, medical conditions, night sweats, pain, radiation, rheumatoid, rheumatoid arthritis, runny nose, seizure, skin, skin cancer, skin cancer symptoms, sore throat, stress, throat cancer, throat cancer symptoms, tonsillitis, trouble breathing, tuberculosis, tumor, unexplained weight loss, viral infection, virus, white blood cells.